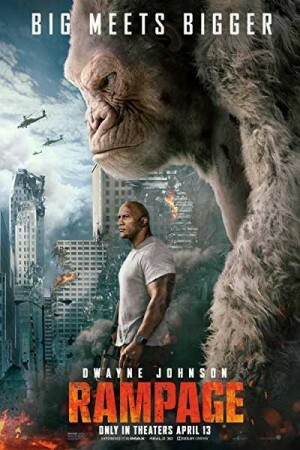 Rampage is an upcoming American science fiction monster film directed by Brad Peyton and featuring Dwayne Johnson and Naomie Harris in the lead roles. Davis Okoye is a primatologist, who keeps people at arm’s length but shares a close bond with his gorilla friend, George. The once sweet-tempered George mutates into a furious, uncontrollable large ape after a genetic experiment goes horribly wrong. Scientists, out of fear that George might cause destruction, put him in a cage which he manages to break out of. With his anger intensified, George goes on a rampage through the country as he battles other similarly mutated creatures, an alligator and a wolf.